For years, every time I turned something on or off I would think "wouldn't it be great if I could control this with a computer?" Well, here's the device I've always wanted! 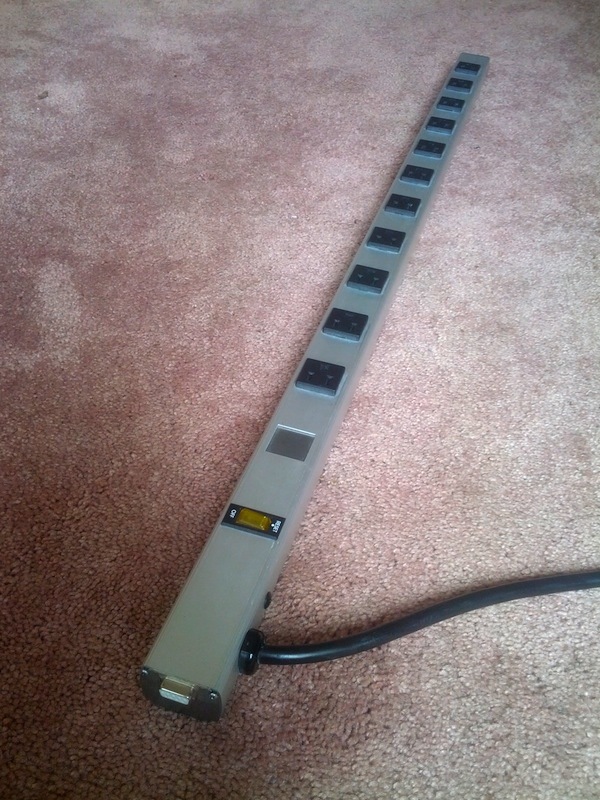 It's a powerstrip modified to connect to a computer, letting you control and fade each socket individually. It cost about $100 to build -- much cheaper than home automation equipment -- and it responds fast enough to control lights to music. Commands are sent through a serial port at the end of the strip. Each socket can provide up to 2 amps (240 watts) and update at 60 hertz. Warning: This project requires working with high-voltage electricity. Don't try something like this unless you know how to do it safely! The following is for documentation, not instruction. Here's a view of the inside. Each socket is controlled by a solid state relay (SSR). I removed the first socket to provide room for the electronics. 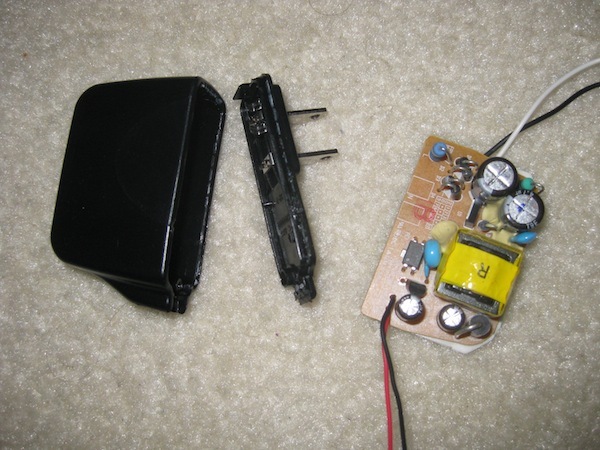 The electronics are powered by a regular 5 volt AC adapter. 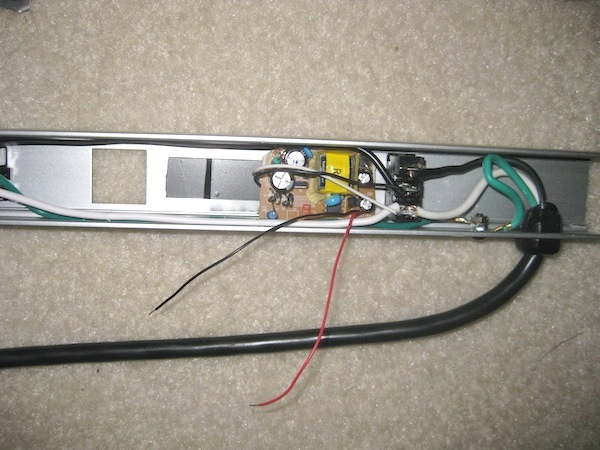 I took it apart and simply tucked the circuit board inside the power strip. 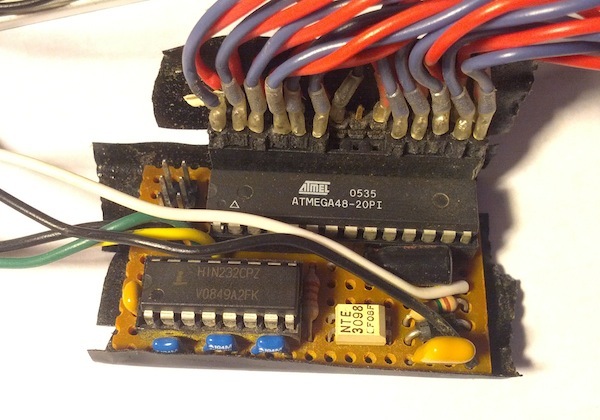 The SSRs plug into a circuit board with a microcontroller, serial transceiver, and optoisolator for AC synchronization input. The circuit board fits next to the power supply, and is connected to a serial port in the end plate of the strip. 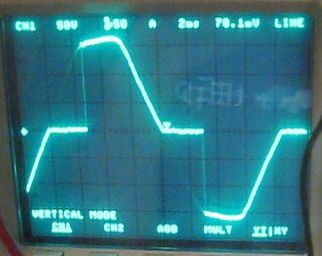 The circuit acts as a fader by switching current on and off at precise times during the 60-hertz AC cycle. 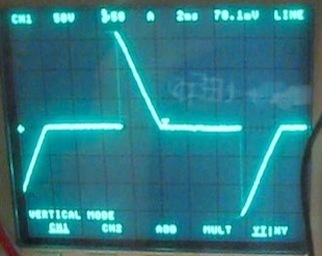 The left image shows the shape of the AC output when dimmed slightly, and the right image shows the output dimmed futher. Sorry, there was a problem showing the code. Try the download link instead. For a while, I connected pretty much everything in my room to the controller. It was great for mood lighting (let me just pull up a command line...), and I scripted a sort of artificial sunrise to help me wake up. 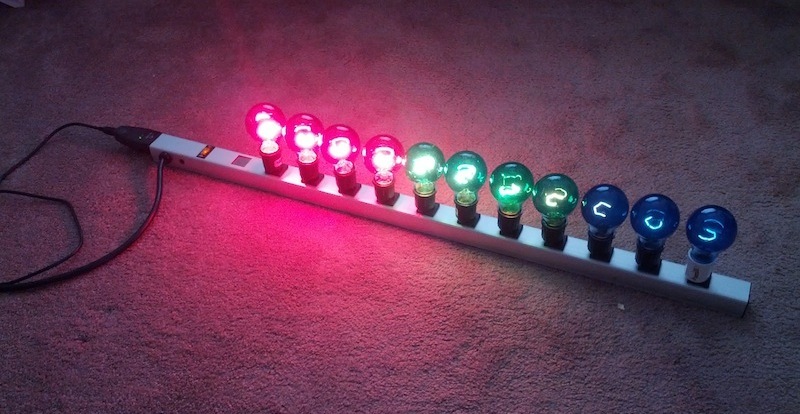 A simple row of light bulbs makes a great sound level meter. At Burningman 2009, strings of chrismas lights connected to the controller formed the pulsing tentacles of a jellyfish dome. It's been to a few parties. 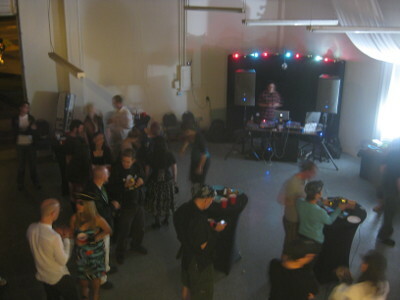 This is the hacker dojo grand opening. 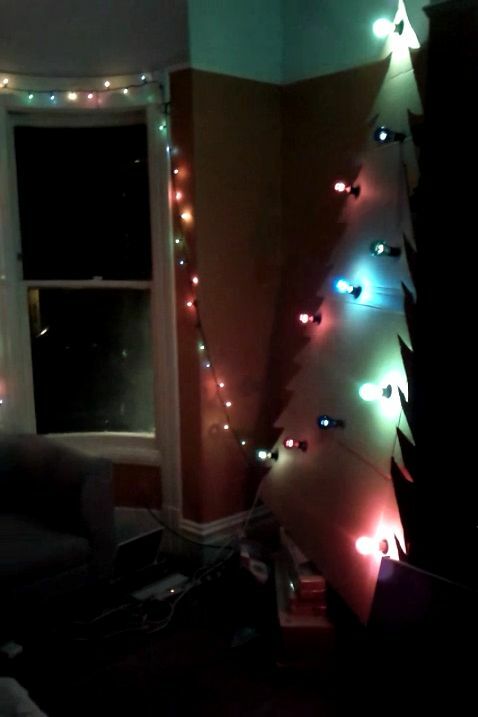 And it greatly improved our cardboard christmas tree.